Face Capturing Module to guarantee the picture quality for official documents. document with biometric information. 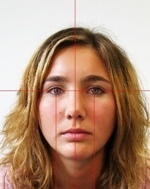 Besides the technical aspects face technology is already integrated in any passports as a photograph. The biometric trait of face recognition can be added into the new ePassport microchip without effecting the existing passport application or the production process. The new ICAO specifications for electronic passports require new qualified methods for the enrolment of personal and biometric data. Therefore ID Travel AG has developed a new system in order to support governments and authorities in capturing personal and biometric data and in order to prepare them according to the ICAO guidelines. The enrolment for the photo/face is done with a video camera or a digital photo camera. In the first step several life pictures of the applicant will be captured. The software checks the quality of the picture and propose the best one according to the photoguidline and ISO 19794-5 standards. Alternatively already existing pictures can also be scanned with any regular scanner from a paper based application form. All captured photos can be printed in the ID document and/or stored as JPEG/JPEG 2000 in the chip. We also offer to generate a template which can be printed in form of a 2D barcode within the document. For further informations you can download our factsheet in english, in german or in french.